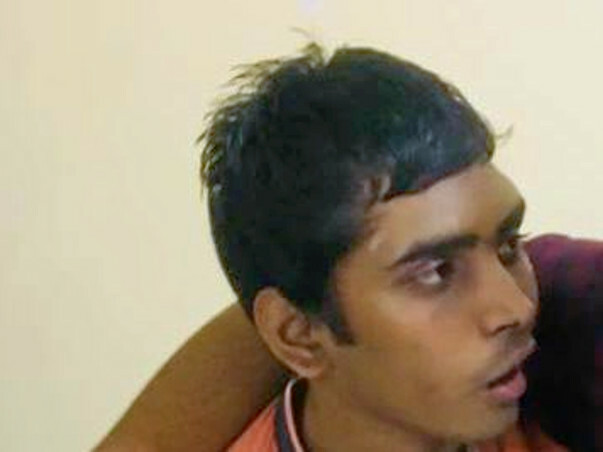 My Friend's brother Aman who is 17 years old met with an accident a month back near Thirssur (Kerala). 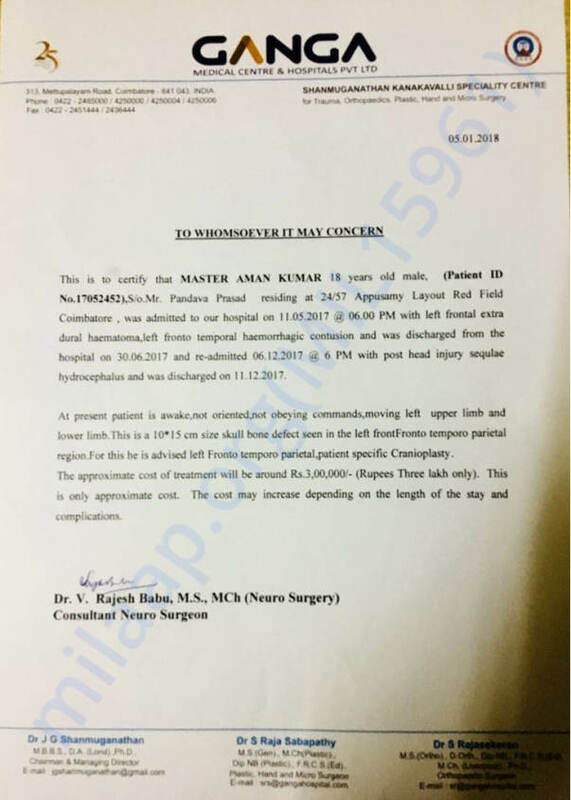 He had gone there with one of his friend and approx at 4am in the morning, they ran into a big pothole whereby Aman slipped and he has got severe head injury. 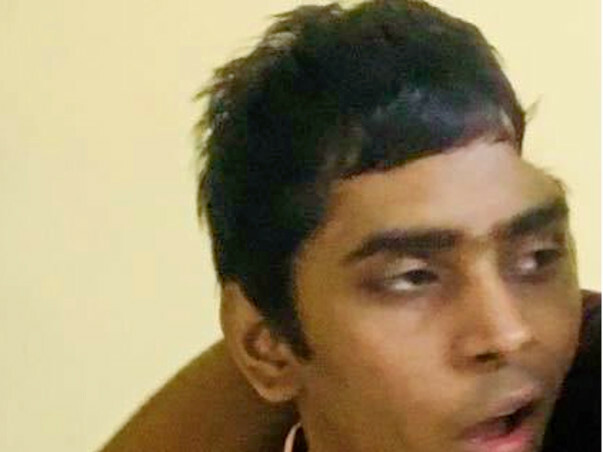 Initially they were spotted by the cops on the Thrissur highway where this incident happened.Then they were taken to a nearby hospital and he was admitted in ICU.The doctors there suggested for a brain operation but they did not have proper facility to operate there at thrissur. Later we had brought him down to Coimbatore which is where we live and got him admitted at GANGA HOSPITALS,COIMBATORE. 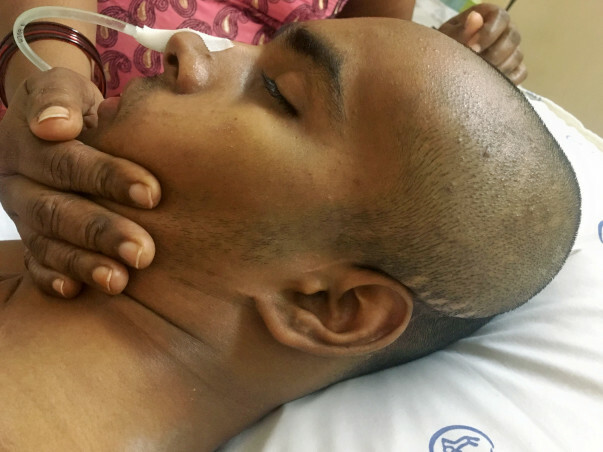 The doctors here suggested for an operation immediately since he became very critical due to lack of proper care at Thrissur and where his brain started developing clots and started swelling. We agreed for the operation and it was done. It took more than one month for him to open his eyes. On asking the doctors they only said that he was very critical and in a serious stage, nothing can be said as of now. 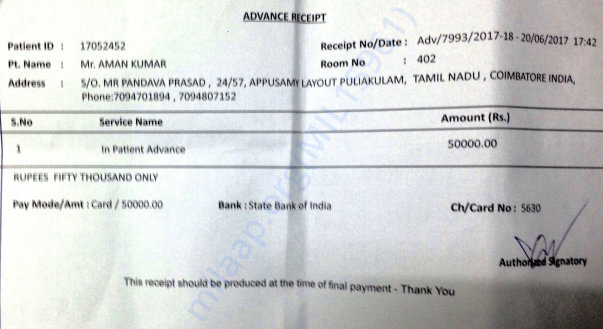 Until now his father has spent close to 9 Lakhs of Rupees (9,00,000) which he managed by borrowing from his Friends. Now the doctors say he has got some improvement but since its regarding head injury the recovery will take its own time. 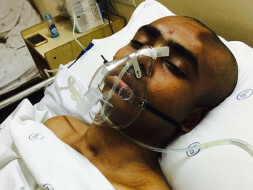 Aman's father requires financial support money to keep the treatment going. So this is a Kind request to all please help Aman come out of this struggle. It would be of great help if some financial support is given to the family to continue his treatment. Request all to Please help the family and extend your support in this terms of need. Please help us to save AMAN. By Gods grace and all our prayers, Aman is recovering. He is trying to talk and we are making him walk with the help of a stick but he still does not remember everyone. His Parents are working hard to bring him to normal where they are teaching him the basic things like his name and mothers name since he does not remember anything. He has reached the stage where he is able to tell his name once asked for. Thank you very much for all the prayers, support and love. Prayers do work. 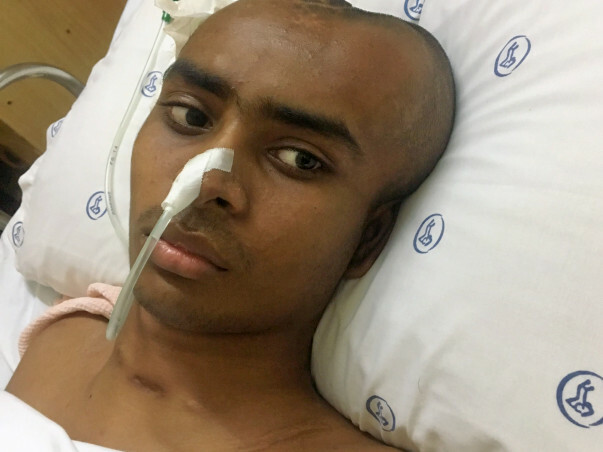 This update is regarding Aman's next surgery which will take place in the coming months. 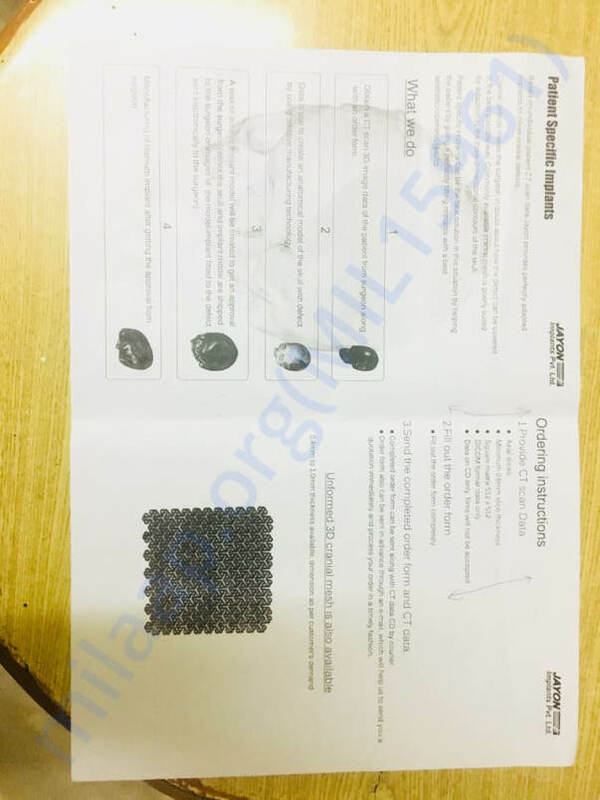 Doctors have still not kept the skull bone for speedy recovery of the brain and healing of the clots so this surgery is regarding placing the skull bone to protect the brain. 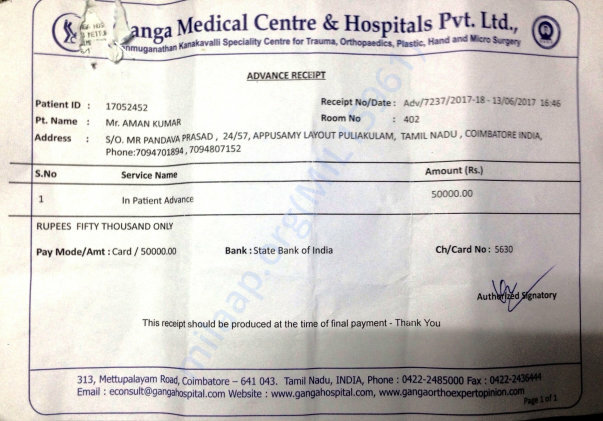 Doctors have to say the operation needs to be done as quick as possible and the estimate which has been given is close to 5,00,000 (5 lakhs). Kindly contribute to the campaign and pray for Aman's speedy recovery. Please pray for Aman. Aman is getting better day by day . He now tries to talk and wants to get up and stand on his own but still he is in subconscious state. We make him sit on wheel chair nowadays and because of this he has learnt to sit. When we try playing some of his favorite songs he tries dancing with one side of his body and that's because the other side doesn't function at all. When on a wheelchair he tries to come to me by moving his one feet. Our prayers have worked. We have come a long way. Really thank all of you from the bottom of my heart for all your love and prayers for Aman. But there is one more thing I would like to tell. Aman still has to undergo another surgery where the doctors will fix an artificial skull bone. It is an important surgery after which we would be able to see quick recovery . 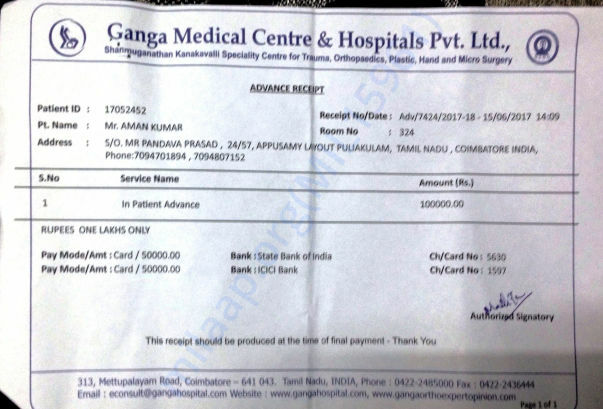 The surgery costs a sum of 3 lakhs and above. We are worried as to where we will go for so much money now. A kind request to please help and support the campaign so that we can bring dear Aman out of all this. Please share the campaign and help us. Please keep your prayers on for aman. 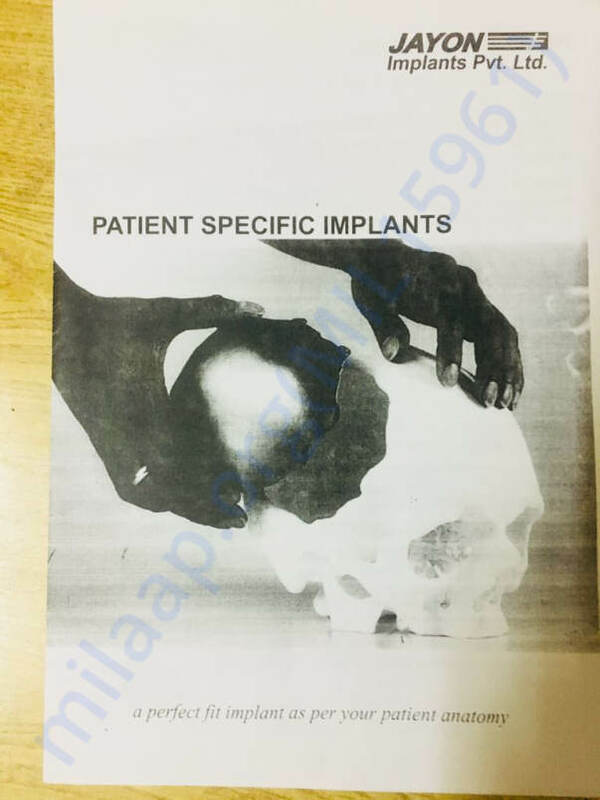 I have attached the surgery documents please read through and share the campaign. Your prayers have done miracles. Thank you for all the support. Thank you for the support that you have shown towards Aman. He is responding to reactions now. He defends himself when someone tries to irritate him or harm him. We could see some improvement in him but he is still under liquid diet and does not recognise anyone. 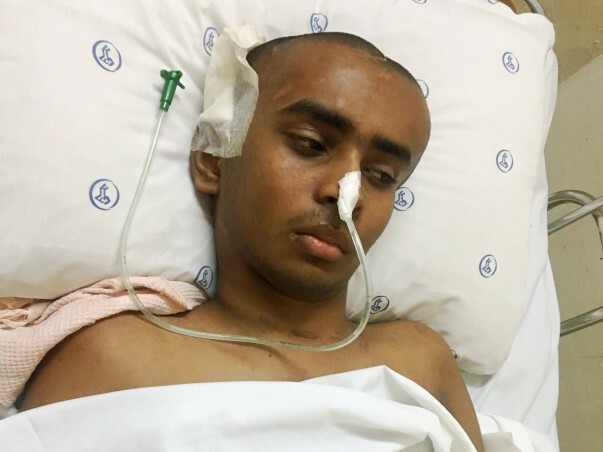 Aman still has to undergo an operation where the doctors will fix his skull bone back and this will take place once he gets absolutely fine. I’m withdrawing some funds to pay for the day to day medical expenses. 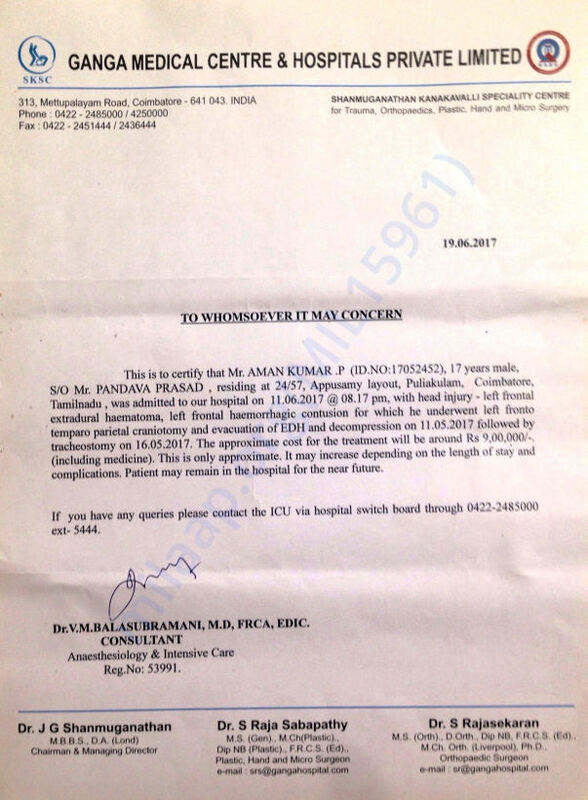 Please continue to provide your valuable support to Aman and pray for his speedy recovery. Thank you for the support. Do share this campaign further with your friends and family to help us in raising funds faster towards his treatment. Will keep you posted. My prayers for your direct recovery, dear Aman. Wishing Aman a speedy recovery. Our prayers are with him.